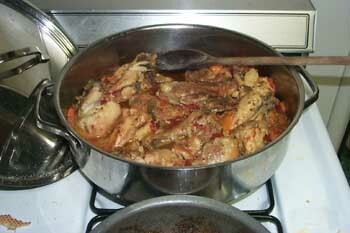 Pollo al chilindrón is one of the most typical Aragonese dishes. 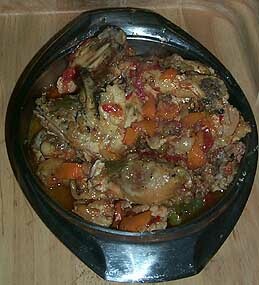 Indeed, red peppers are a very common ingredient in Aragonese food in general. Peppers in the region are supposed to be excellent, though of course we have to make do with what we can find at our local markets. I liked this dish, which I made by combining two different recipes, quite a bit. I think I should have used more pimientos, however, these (usually imported from Spain) are often available in the Mexican section of supermarkets. I was also unable to use a red bell pepper as my supermarket was out of them at the time, so I substituted with an orange pepper. I'm sure it would have been better with a red one. This dish ultimately made me realize just how good peppers are and how I should really cook with them more often. Heat oil on a large sauce pan. Add onion, garlic and chicken and fry until the chicken is browned and the onion is golden. Pour cognac over the chicken. Add prosciutoo and mix. Add paprika and mix. Add tomatoes, peppers and pimientos and mix. Cover and simmer for about 45 minutes or until done. Adapted from Delicioso and this recipe.